The following is a letter from a Punggol resident to the Minister for National Development. I have been living in a hdb flat all my life and am very proud of the quality of life it has provided me and my family. I have stayed in various types of housing in Singapore (from Jalan Rumah Tinggi, Kim Pong road, Spottiswoode Park, Everton Park, Punggol). Everything have changed for the better from since the seventies – from squatting to sitting toilet bowl, from a simple half height louvre window to a full-height condo style window, from a simple cement screed to elegant polished marble floor, much better rubbish chute management system, much better overall design. But one peculiar issue hasnot changed at all – corridor clutter. In my humble opinion, apart from the hazard which clutter poses and the impact on public health, it has cost much social and racial tension. 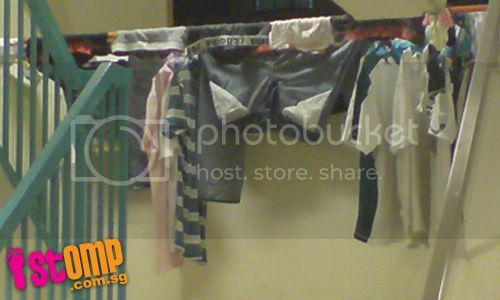 A google for ‘HDB corridor clutter’ will return countless reports on this issue. Many have expressed frustration in living with inconsiderate neighbors. In extreme cases, some have resorted to selling their flat and looked for a better environment. In others’ view, it may look impulsive or even silly to do so, but I believe if we were in their shoes, we may do the same. 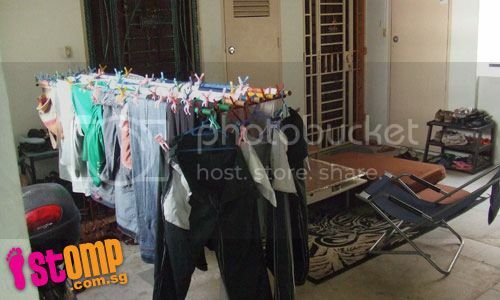 A browse through the forum at www.stomp.com.sg and you will realize that many have in fact first resort to friendly negotiation with the neighbours responsible, then a complaint to the town council. Some have reported that town councils were exercising double standards – sometimes a warning letter was served, at other times it turned a blind eye. Some would clear the clutter after the town council’s intervention. Yes, public education is crucial. But it seems like we are playing tennis without court lines demarcating the rules of the games. We are told not to obstruct the corridors with clutter, but what constitutes clutter? A shoe rack? A pot of plant or 10 pots of plants? What started out as the greening of our corridors has transformed into a jungle, junkyard and in some extreme case, a private garden complete with sofas, carpet and coffee tables. I personally am experiencing this problem with my neighbor. I have friends who have gone through worse. Their encounters would end up with police intervention and eventually have had to settle the cases out of court. In my case, friendly confrontation had failed. My wife and I have been holding back on our next course of action because we know that there will be no turning back . One may ask if I am being petty. While I believe a clean clutterless corridor is good for everyone, others feel common space not fully utilised is wasteful,. 1. Storing of unused items like furniture, boxes etc along corridor that can cost fire and also hinders fire escape. 2. Storing of similar items near or against gas meter doors, very dangerous as it’s near gas pipe. 3. Hanging of laundry along corridor railing. 4. In some extreme cases, some owner lay large carpet over some odd corridor corner that hinder the routine washing of the floors. 5. Placement of plant pots poses the danger of mosquitoes breeding. 6. Fighting over corridor space is pointless and do more harm to our social and racial relationship. 7. Value of our property: the corridor is the first impression on any potential buyer. A property website I came across (see here) even advised potential buyer to avoid buying houses with such conditions. 2. If some items are allowed, owner should take ownership of the items and be held responsible for it by demarcating a small section at the side or front of their main door. Only items like plants and shoe racks will be allowed to be place there. All other items placed outside of the demarcation will be removed by authorities without question. Town councils will have a much easier job. 3. Strictly no items to be placed near gas meters’ door area. 4. Strictly no item or laundry to be hanged over corridor railing. 5. 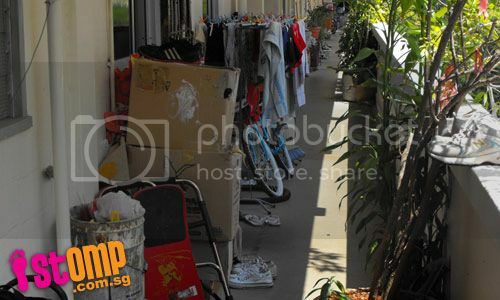 Town councils need to step up effort to do more routine checks and take strict action to remove clutter and not only when residents complaint. 6. Town councils may even impose higher SC/CC fee for owner violating the law, and reward others who keep their corridors clutter-free. This will certainly motivate everyone to do their part. 7. As Town Councils performance is now assessed every year, corridor condition should form a big part of the assessment as well. I strongly believe if media exposure was focused on this matter, corridor clutter will be the thing of the past in no time. And all neighbors will be living under the same guidelines from the authorities. I am deeply concerned about the future of living in a HDB heartland – with the influx of foreigners buying up and making HDB their homes, bringing with them cultures of their own. Without strict laws we may just be living with more tension despite better facilities and architectural aesthetics. Our social graciousness will simply not be keeping pace with the progress in public housing. Nevertheless thank you and good job to HDB for providing many of us quality housing, improved facilities year after year. Read also: Town councils – irresponsible to continue ignoring corridor clutter.